This wonderfully collected and eclectic living room is just off of this kitchen that I recently showed you. These wonderful clients had lots of fun pieces that were inherited through their family and they wanted to include them in their new design. We added lots of fresh new pieces, like the Lucite console behind the sofa, to balance the old and give the space a 'collected over time' vibe and prevent the room from feeling like a room full of old furniture. This fabulous sofa, that was inherited from her mother, is one such example of this as well. I blogged about it's drastic makeover here. 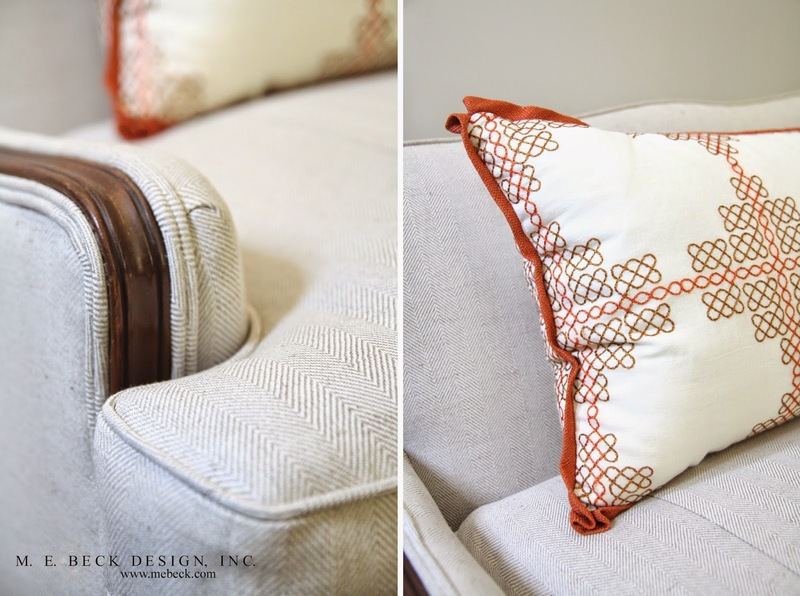 The bright new fabrics and modern bolster, as opposed to typical throw pillows, have given this piece a brand new life. The touch of zebra layered on top of the jute rug underfoot gives a touch of playful pattern. We designed a fun, and a bit funky, little powder bath that is off of this space as well. That will be coming up soon. This sweet, little kitchen is part of a new construction project that was designed to look old. I wish that there was more new construction out there that was modeled after the classics, but that's just me. This space is clean lined, bright and has just the right amount of vintage charm. We opted for a taupe color on the island that complements the dining room that is parallel and open to the kitchen. Beveled subway tiles and honed Cararra marble complete the monochromatic palette. I wonder when I'll tire of these building elements. We specified a stainless steel apron front sink for it's clean-ability. I'll be back soon with the fun, eclectic living room that is right off of this sweet, little kitchen. I hope you all had a blessed Easter! If you follow me on Instagram then you've already seen some of our Easter fun. Easter is a time for celebration indeed. He is Risen! ...from the master bedroom into the lovely master bath in this pretty, monochromatic suite. We carried the gray palette into the bathroom with loads of delicious Cararra marble on pretty much every surface. It's clean, simple and tailored, and in my opinion, simplicity is beautiful! How about that bathtub? Perfect right?! The shower is decked out with Cararra bricks and a grounding gray, hexagon mesh floor. If you can avoid the "wall of mirror" over a vanity, do it, it looks much more custom to individualize the vanities and, frankly, it is just more interesting to look at than a full wall reflection of the room. Those ball and claw feet vintage-ly divine!! We opted for a large scale herringbone on the floor and I love the effect! I just love how this space turned out! If I lived here it would be all too tempting to lock myself into this lovely suite! I'm so excited for Easter next week! It is one of my favorite celebrations! I hope you're all planning something fun! Serene...that's the first word I think of when I'm in this space. I recently completed this Dallas master bedroom and the client and I couldn't be more pleased with the soothing palette and unfussy lines. It's one of those spaces where you can sit back and take deep breaths. It's crisp and relaxing. The cool gray walls and warm gold accents are one of my favorite couples. They just work so well together! Don't be afraid to mix your metals either. Notice our chandelier is polished nickel. I love it when everything isn't 'matchy-matchy'. Also note the scale of our bachelor chest nightstands. One of the most common mistakes I see in my client's homes, when I first come in to help, are nightstands and bedside lamps that aren't the correct scale. Push the limit with these pieces! You'll be surprised how much bigger your space looks when you use larger pieces. Keep your nightstands clutter free. Dress them up. This is the first thing you see in the morning and the last thing you see at night. Use items that relax you and make you happy, like your favorite photos, flowers or simple trinkets. Simple is the key word here. A nightstand can get bogged down really quick. If you have lots of little things you love, switch them out often. They don't all have to be displayed at the same time. I love distressed hardware on a smooth, refined veneer. It creates such wonderful tension. Don't you want to just kick back in here? I know I do. Thank you to the Threadgill family for trusting me implicitly with your home. We've got lots more beauty to show from this stunning Dallas residence. Isn't the beginning of a new month such an energizing time? It's a fresh start. I particularly love April. Easter and celebrating our Savior is right on the horizon. Spring temps, windows open and the greening up of everything makes me want to tackle tasks. We live in South Texas, so luckily we are already experiencing Spring, sorry Northern people :-/ I began some planting yesterday...petunias, salvia, snapdragons, dahlias. Got my herbs in too...sweet basil, flat leaf Italian parsley, cilantro, rosemary. We've got lots more to do but it's a good start. I hope you're having a great start to the week...and the month. Happy April!